I can't believe it, but I finished my daughters Halloween costume way early! I don't think I've ever made her a costume for Halloween in all 8 years. 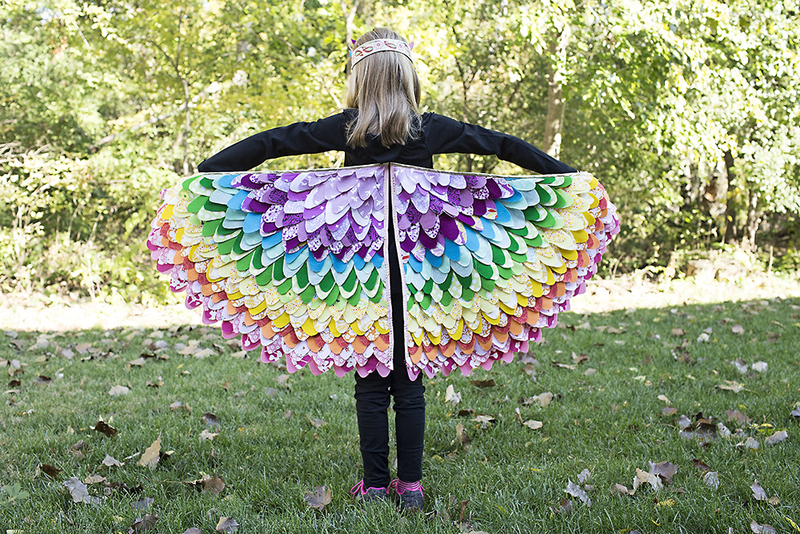 But not long ago I pinned some costume ideas on Pinterest and she really loved these bird wings. I followed the general idea on both this website and this website (this second link for the headpiece as well). I didn't worry about making each wing a perfect 1/4 circle. I measured the length of her arm and the length down her back. I cut a rectangle that size and then just eyeballed a curved line between the two. I want her to be able to put the costume on by herself for her school party, so I used some sparkly black elastic about 3/4" thick that I found at JoAnns for the arm holds. It's not too tight for her and there is nothing for her to tie (or really, for her teacher to tie). For the headpiece, I followed the general instructions here. (But again, I didn't make it tie, just sized it to her head.) The ribbon is Renaissance Ribbons by Anna Maria Horner. I've had them forever! Happy to finally use them. 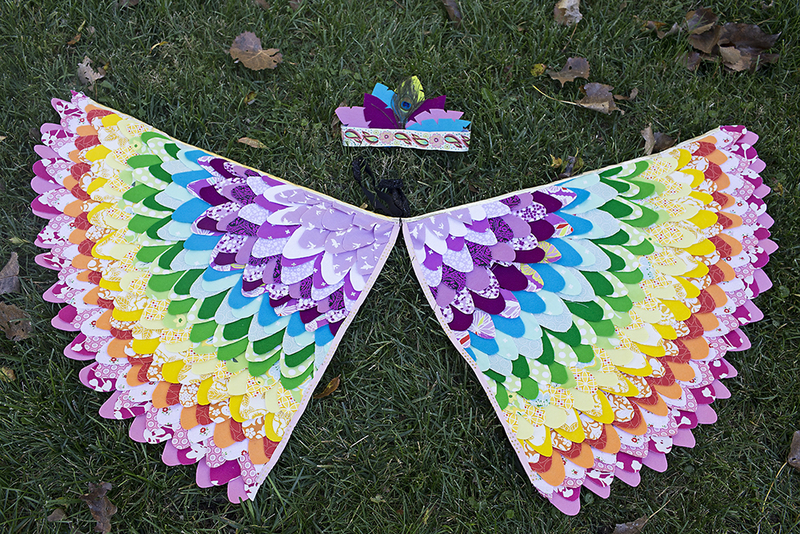 The wings at headpiece use a variety of fabrics (handpicked by my daughter) and wool felt. I love wool felt, it is such good quality compared to craft felt from big box craft stores. It comes in so handy for craft projects. One of my sponsors even carries some in her shop - Fabric Spark! My daughter love, love, loves it. **I know I generally ask you not to Pin pictures with my kids on Pinterest, but feel free to Pin any of these Halloween costume photos. ** Now to finish my son's costume. He has a much simpler request - a skeleton. Not quilting related, but my kids had off school Thursday and Friday so we decided to have a little fun in Chicago. We took a day trip Friday to the Art Institute. I had my kids bring sketchpads and colored pencils, and they spent the day finding their favorite artwork and recreating it themselves. 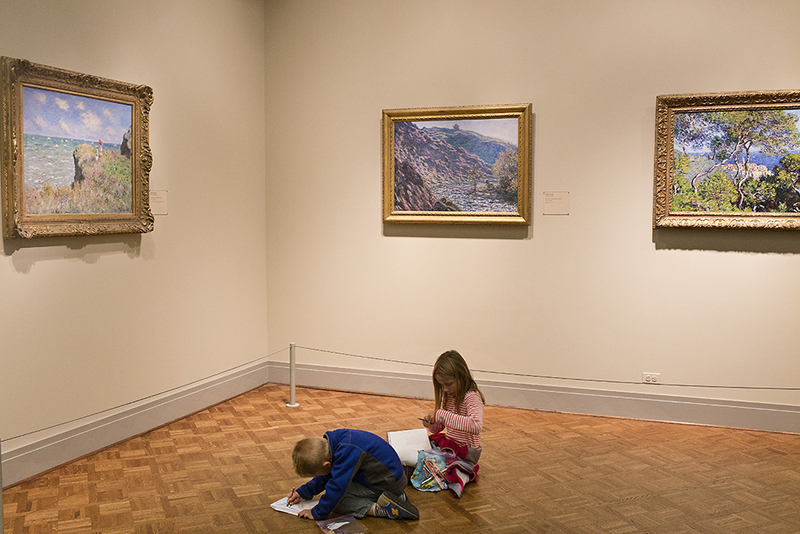 This is such a fun way for kids to experience art museums. It makes them really look at the artwork and not just walk on by, bored after a couple rooms. It doesn't matter AT ALL if they are artistically gifted. It makes them notice details in the paintings that they would have missed otherwise. The staff in each room allowed them to sit on the floor if benches weren't around. I think the only time in the past we were not allowed to do this was in special exhibit areas (too crowded). We are so spoiled to have all these awesome works of art practically in our backyard. The fact that we can drive 45 minutes and then spend our day surrounded by Monet and Picasso and Matisse...just incredibly lucky. I knew my daughter would have fun (we've done this before), but this is the first time I've brought my 5 year old - very active - son. He LOVED it. He wanted to draw everything he saw. He was so calm and concentrated so hard, he did not want to leave at the end of our time there. I definitely recommend checking out the Art Institute, even with young kids, if you are ever in Chicago. We only made it through 3 sections - Impressionism, Modern American Art 1900-1950 and Modern Art (3rd floor in the modern wing) so we will be back to explore more soon.